Emily Taylor, 15, is a fifth-generation commercial fisherman in the Naknek-Kvichak district. She’s against the mine and worries her children or grandchildren will only know of fishing from family stories. Photo: Liz Ruskin. 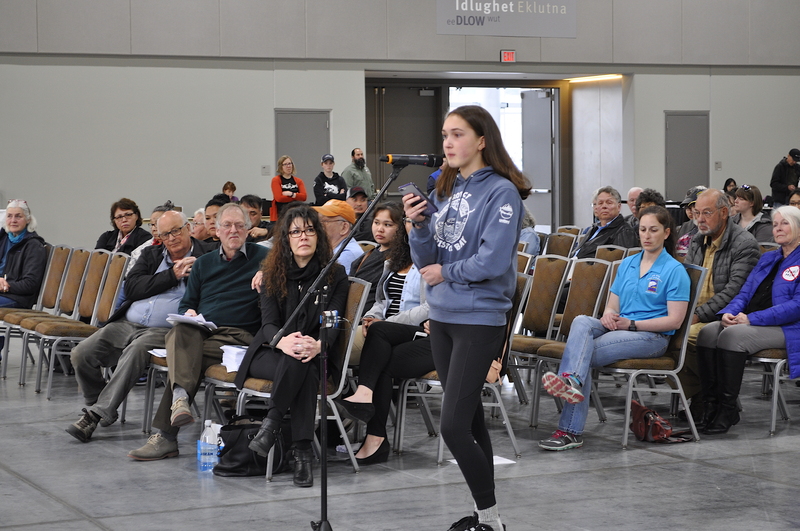 People who oppose the Pebble Mine – and quite a few who support it – came out in force Tuesday for the final Corps of Engineers hearing on the proposed mine. Dozens were in line when the doors opened on the hearing at the Dena’ina Center in Anchorage. Speakers criticized the adequacy of the Corps’ draft environmental impact statement. Many highlighted the importance of the salmon runs in Bristol Bay, downstream from the proposed mine. Taylor said she hopes to pass her salmon permit and setnet fishing tradition on to her heirs, but she says a mine could end all that. Her hand shook as she read from her cell phone screen. “I don’t want my children and grandchildren to have to ask me what it was like to go fishing. Do you think they’ll ask me about this day? What I did to stop it? I don’t want that to become my reality,” she said. Mine opponents also said they worry about the fisheries of Cook Inlet. Pebble developers want to build a subsea gas pipeline under the inlet. A few speakers said the environmental impact statement should consider the bears of the McNeil River State Game Sanctuary and Refuge, near the proposed pipeline and road corridor. “I think that the people of Alaska have got a standard of living you’d like to maintain, and if we don’t diversify our economy, that’s not going happen,” Sturgeon said. Many people from the Bristol Bay region spoke against the mine but a few said jobs are paramount. Jimmy Hurley Sr. of Ekwok said he had to leave his community and now works in Togiak, hauling fuel. He said salmon aren’t enough for the young people in Ekwok. The public comment period closes May 30. The Corps of Engineers expects to issue its final Environmental Impact Statement early next year, and then decide whether to issue permits.